Kevin Allen has released a fantastic choral collection choirs everywhere will welcome. Click here to download a sample page. This collection is for SAB: Soprano, Alto, Bass. It is 42 pages long. It was published in 2016. The composer is Kevin Allen, highly regarded as a composer of opera, chamber, and orchestral music. He has developed a unique reputation as a composer of church music for the Roman Rite. 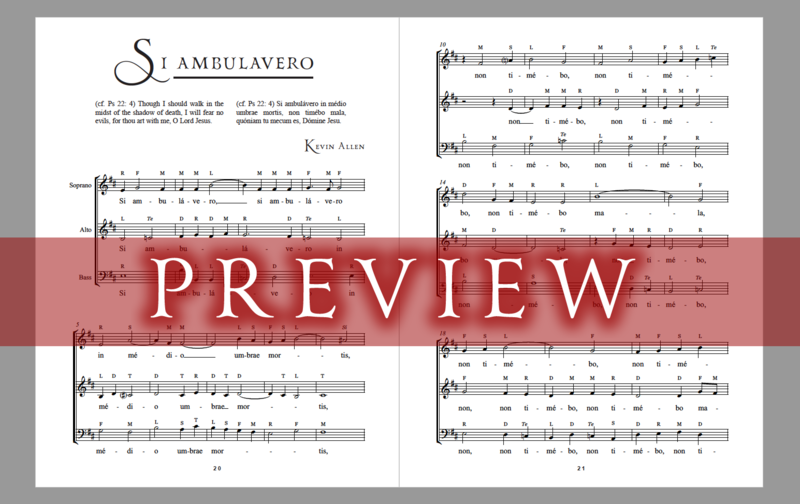 Depending on how the psalm verses are sung—a decision left to each choirmaster—these pieces can be as long or short as necessary to match the liturgical action. THIS COLLECTION was commissioned by CORPUS CHRISTI WATERSHED and published in September of 2016. In accordance with our customs, all proceeds which exceed production costs (printing, shipping, and so forth) go directly to the Catholic artist, who maintains copyright. Therefore, when you purchase these books, you are directly supporting Roman Catholic artists who produce works for the Church. We are a 100% volunteer organization.